Use the Torsion Calculator to help determine your ideal hinge combination. 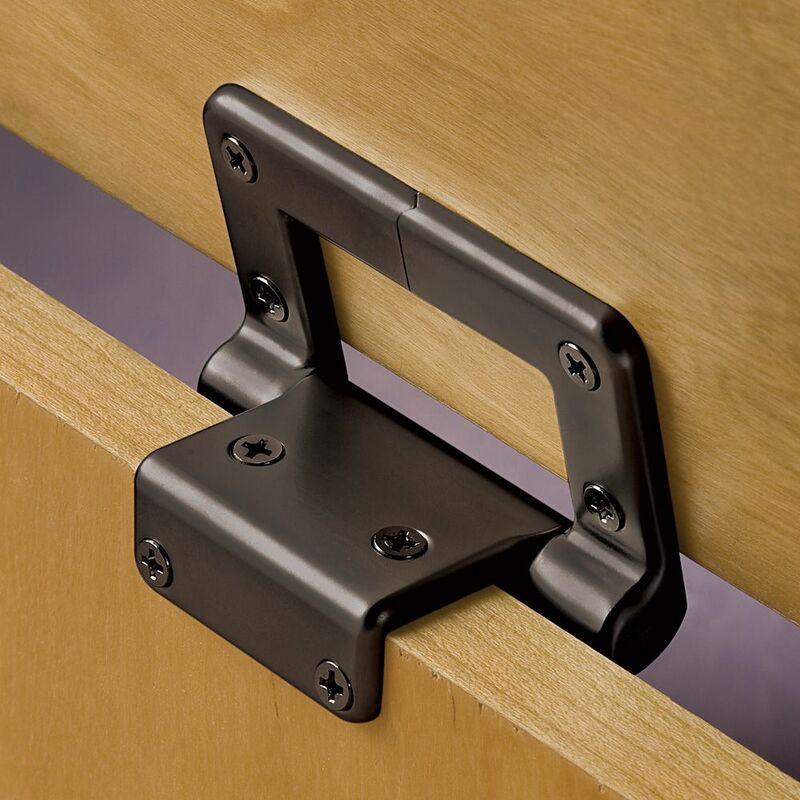 For best results, choose a combination of hinges that provides as close to your lid's required support as possible. 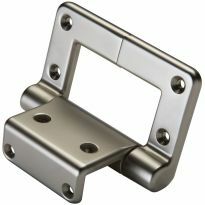 Similar to hinges in laptop computers, these heavy-duty cast-zinc hinges allow virtually any size lid to open smoothly, hold its position (when opened to 90 degrees, beyond that the lid will swing open), and then easily close - all with little effort and no additional hardware! Now available in two attractive finishes, Satin Nickel and Rustic Bronze, to complement any project - from chests, to boxes, to storage units, and more! Designed to fit 3/4" thick stock. 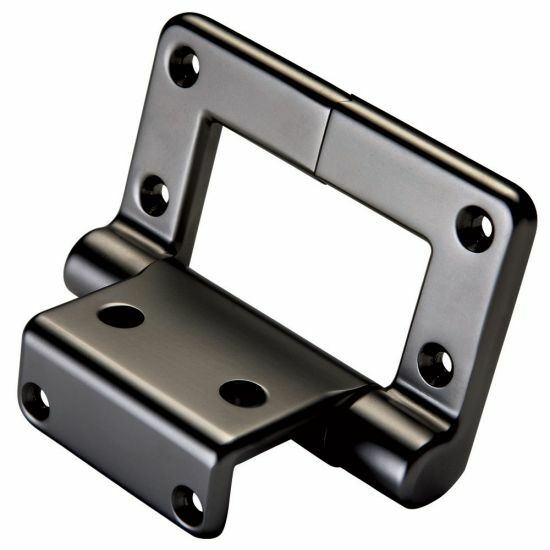 Hinges are available in 15, 30, 40, and 60 inch-pound ratings. 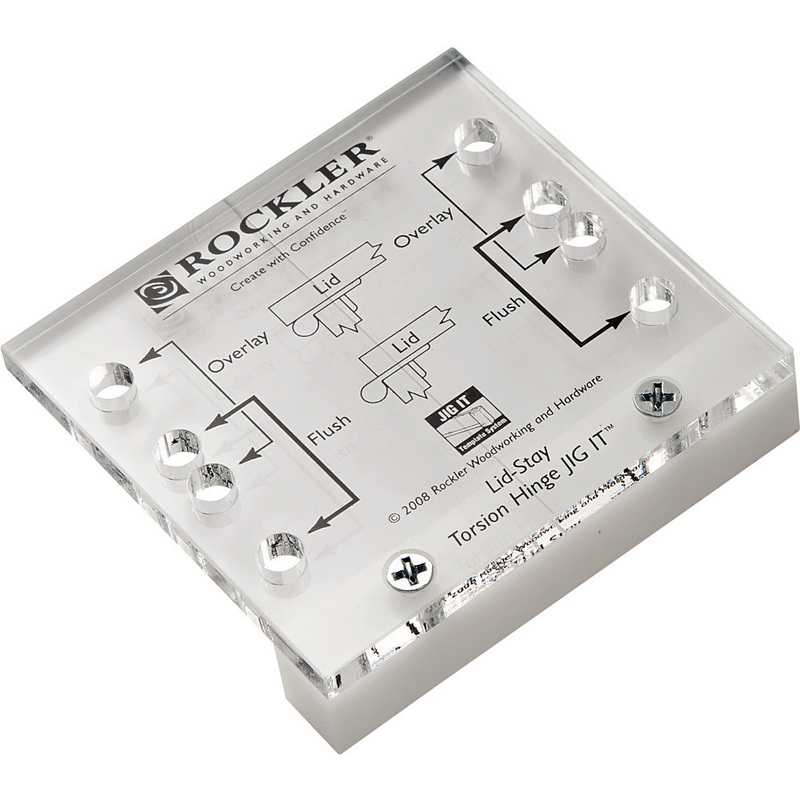 For faster and more precise installation, we recommend using our Rockler Lid-Stay Torsion Hinge JIG IT® to make installation of these hinges accurate and easy. Perfect product, I got the strongest ones for my sons toybox and it was a little overkill, he prob won’t be able to move it till he’s a little older but works great. 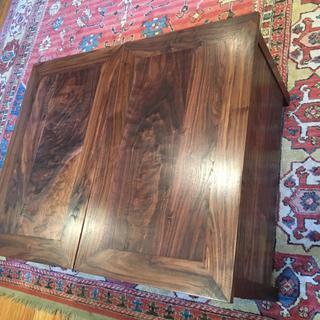 I purchased a set of 60 in pound hinges for a rather heavy lid on a solid walnut chest I had just built. It is rather large and not for storing children's toys. As such I didn't worry much about closing on my fingers. I was concerned that two hinges would be enough but after reading reviews I put in one set, reserving the option to add a third in the center. I found two sufficient. The lid opens fully vertical and stays open at around 60 degrees. Below that it wants to close fully. This is just what I need. Fully open to access what is inside and partially open for a quick pick off the top items. Very sturdy and easy to install. Torsion hinges worked as intended on my grand-daughters toy box. Easy to install. Not sure another 5-star review is necessary since there are already so many, but I'll add my 2 cents anyway. These are great hinges. They're easy to install, and they work as stated. The calculator used to determine the appropriate numbers / weight ratios works correctly. The end result is a product you can be proud of. I recommend using the hinge drilling bits associated with these hinges. They made installation so much easier. 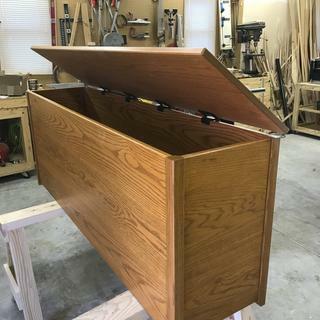 I was actually dreading the mounting of the lid on my cedar chest but when I got to it, the hinges and drill bits made it so very easy and quick. I did recess the hinges so that the lid sits nearly flush with the chest with only a slight gap. This worked very well. I intentionally left a little gap so that some air could get into the chest in the event a child ever decided to crawl into it. The torsion hinges alleviate any fear of the lid slamming on their fingers. A bit expensive but in my opinion, all things considered, worth the price. The number of positive reviews on these ought to convince anyone with doubts on that. I purchased a pair of these for my granddaughters toy box build. I needed to make sure the lid wouldn't shut on her fingers, these hinges do the job perfectly! Installed on chest I built for a friend. The torsion hinges worked perfectly. Good stability without too much resistance and quiet! Used for about a year now and as good as the first day. 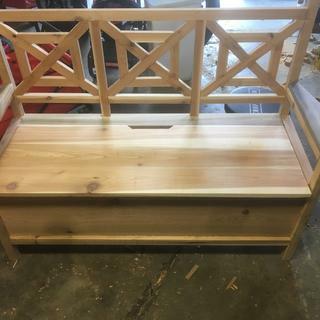 Made a bench with hidden storage under the seat and needed a hinge that didn't allow the seat to "slam" down. These are perfect. I got 2 x 40lb hinges, which may have been a little overkill, but they work great and keep the lid exactly where you tilt it. I searched all over the web and home improvement stores and I wasn't able to find anything similar anywhere else. Will probably purchase 2 more for another project soon. It is a great thing for young kids' toy boxes. I have tried other hinges & find this hinge to be super to others. They were easy to install & nice looking. Very pleased with the hinges, Will use in the future. These work great at keeping lids of chests open exactly where you open to. They do however make the lid feel very heavy when first opening. I have always used the recommended sizes, but going a bit undersized may work if you are not concerned about lids staying exactly where you put them. THESE HINGES ARE WORTH THE MONEY WHEN I MADE BOTH MY GRANDDAUGHTERS TOY BOXES. LAST THING I WANTED WAS FOR THE COVER TO SLAM ON THEM. 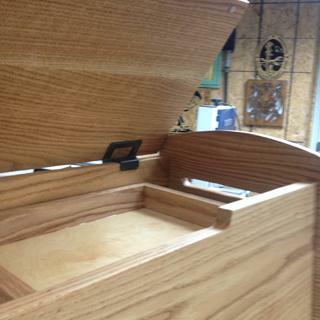 These hinges work perfect for cedar chests. I have used 15, 30, and 45 foot pound rated hinges for the lids. The correct rating will allow the lid to close smoothly without smashing fingers because of its weight. These work like the hinges on a laptop, making them the perfect choice for a toy box lid that could crush little fingers. I used the calculator to select the hinges, and they worked just as I'd hoped. The only issue that you may need to deal with -- as non-mortised hinges, they leave a gap of about 3/32 between the case and the lid. I dealt with that by adding spacers on the sides and front of the chest. Have used these hinges before with good results but because they are so expensive I reserve use for projects where safety is an issue. Perfect product for chest lids. I used these hinges on the cedar chest that I built and found them to be the best product I have used to prevent the lid from slamming shut. I also purchased the drill jig that is recommended for installing the hinges and it made installation easy and accurate. I will definitely use these products on future projects. It takes a bit to calculate, but other than that the hinge system is easy, fast or you might say fastastic! They worked great on the shoe chest I made for my daughter for Christmas. And they arrived a day earlier than scheduled which was an added bonus. Perfect hinge for my toybox lid so it doesn’t slam on little fingers! Perfect hardware for my blanket chest project. 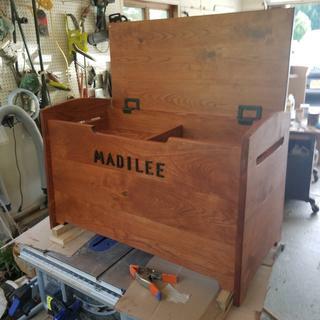 Made a chest for my grand daughter that is starting out its use as a toy box. Needed the safety of the torsion hinge to protect her fingers until she grows up and transitions the piece over to use as a blanket chest. Full one inch thick pine lid 20 inches by 44 inches and with just two of these hinges the lid stays in whatever position you leave it. Worth every penny. I love this hinge. The lid stays where you open it to. Make Shute you follow the order guide to make sure you have the right size and number of hinges needed for the job. I would order this hinge again! I have tried a couple of interior hinge systems for heavy-duty toy boxes but nothing was that stable. The torsion hinges are a bit spend, but well worth it in terms of quality and confidence that the lid will not come down on little fingers. Hinges are the best! I overlapped the back of the hinges by 1/8 inch no problem. Easy to install. Wonderful product! I would highly recommend getting these hinges for making toy boxes, never have to worry about the kids slamming the lid on your fingers. 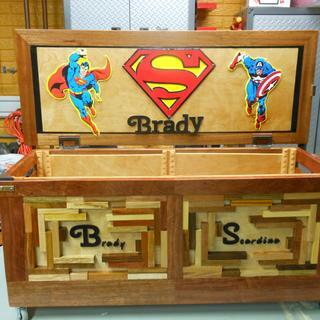 I have made three toy boxes so far and looking at making two more. Works well and as it should. These hinges will keep little fingers safe. This the safest lid hing for kids toy boxes. I have made seven large toy boxes with no injuries at all. They work great. Keeps the lid in any position that you want it in. Don't have to worry about it slamming on you. High quality, great directions, easy to install. This hinge is a replacement for a nearly 20 year old one that has been in daily use. The new one is an exact duplicate of the old one. They do the job and do it well. These work great I should have added a 3rd center hinge of 15 inch pounds but it stays open in a vertical position. I ordered before I weighed my door.. While not inexpensive, worth every penny for my grandchildren , (4 under 4 years old) They hold the lid to my wifes old toy chest in any posisition you lift it to.Highly recommend!! Hinges are well made and easy to install. Work amazingly well. Unfortunately are amazingly expensive. I would recommend them, but choose wisely due to expense. My wife had a clothes hamper that was made of tubular steel with three hanging canvas bags. Unfortunately, our new dog could pull socks out of the canvas bags. So I replaced the tubular frame with a stile and rail cabinet out of poplar and birch plywood. Used Rockler's online calculator to determine which hinges I would need for the weight and span of my lid, and they work flawlessly. Excellent hinges and worth the money. I use have used these hinges for about 6 years now. 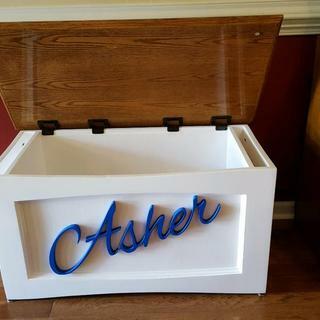 I use them on custom built toy boxes/chests. They have never failed! Easy to figure out the size you need. 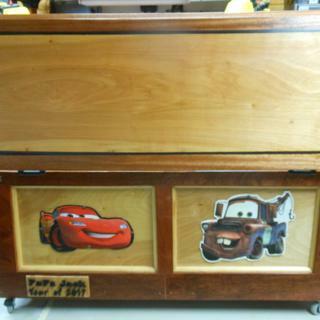 Since these toy boxes/chests go to my grandchildren I would only use the best. I highly recommend this product. If you get the Rockler sales catalog or emails you can catch them on sale once in awhile. While a bit expensive these hinges are super easy to install (I did buy the jig). The functionality is terrific while keeping little fingers safe. Would love to see them come in an antique brass and an old black iron color in the future. Fantastic. Keeps lid open like it's supposed to. building a toy box for my granddaughter and wanted a safe closing mechanism. Building a toy box for my gran daughter, don't want her fingers smashed. 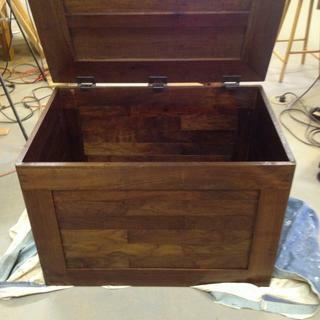 Have an old water chest with lid that needs these hinges for safety. Have used these before on a toy box and they work great! Am building a chest. These are good. stay torsion hinge lid support in rustic bronze. He was very impressed by the support they provide. I have two young kids and five nieces and nephews. I wouldn’t use any other product when attaching the lids to the toy chests they’ve all received. Best product on the market! They appear to be the safest bet for preventing smashed fingers on the Hope chests I am making. We have a wood toy box that has spring hinges to hold up the lid but it was always difficult to close for our kids. Now the spring is worn out and doesn't hold the lid open anymore. 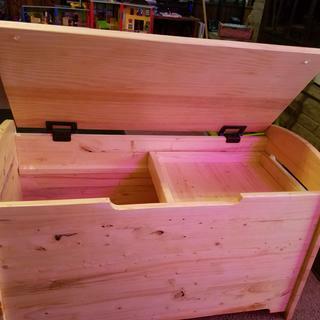 We are again using this toy box but this time for our granddaughter and we need some new hinges that she can work and won't smash her hands and these look to be perfect. 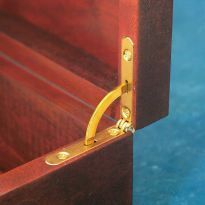 This was the type of hinge suggested in a woodworking magazine. Have used it before on prior projects and works well for the intended purpose. 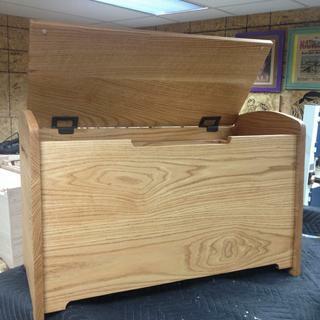 Made a dovetail toy box for a great nephew. 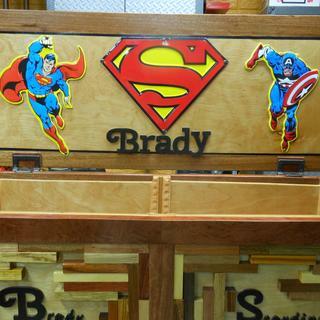 Making a toy box. The reviews sounded like these are a good choice. Like the idea of a hinge and lid stay all in one. Less hardware, cleaner look. I've used these in the past and like the functionality and classic design. The wood whisperer used these in a project. They work great and you don't have to worry about someone getting heart by a falling lid. Replaces a 30lb torsion hinge/too much torsion. Used before and they work well. Needed a simple hinge that also worked as a stay. We’ll see if there are the quality issues that are reported on the review pages. I have used these previously several times. They provide excellent service without having to use lid support. Because I like my fingers. My husband is making a toy chest for our grandson and protecting little fingers is important. He made a sample and the lid stayed open for days. 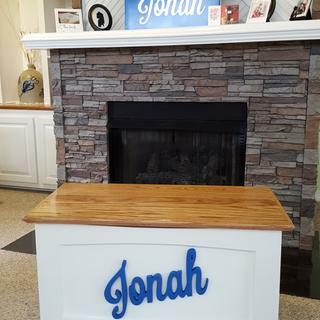 Grand Kids Treasure Boxes with their names routered in the lids. I've already made four now I have two more orders. Because one of these on a box of ours broke. Not sure what kind of warrantee you provide so ordered new ones. How far does the top have to overhang the back of the chest to fully cover the hinge? BEST ANSWER: When I make the box the hinge sticks out beyond the box the width of the hinge portion. the back of packaging has a detailed drawing, refer to it for dimensions. Uh... but I want to know this BEFORE I buy the hinges. Could you post a photo please? How would these hinges hold up outside? Building a poolside storage box ... in the event you have a better option for exterior use. What is the Warranty on lid stay torsion hinge? Will these work if you need to place the box side of the hinge on the vertical part of the box instead of the top, flat surface or is there something else that could be recommended for that kind of application? BEST ANSWER: Not sure. The hinge works well when used to support a box lid which opens from horizontal to vertical, but I don't know if the hinge would hold when used on a vertical to horizontal set-up. Might work as a hinge, but the self-support may not work. 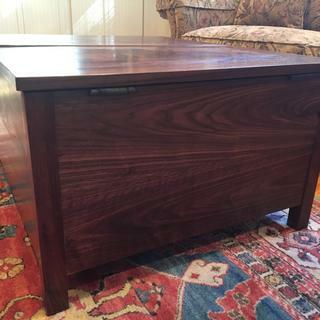 Building a blanket chest out of 3/4" purpleheart. The lid will be 22" x 48". I understand the weight will be approximately 37 lbs (based upon 5.02 lbs/bd.ft. the calculator says I need 407 in.lbs but also says the lid is over the recommended limit. Any thoughts here? 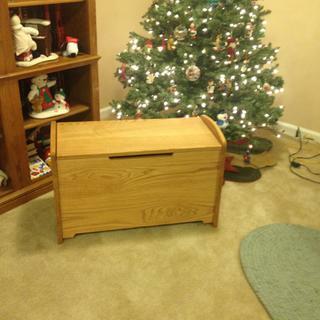 BEST ANSWER: Hello Frank - I built a blanket chest this year with almost the same sized top, mine weighed 35 pounds. I used 2 60inch hinges and a 40 inch in the center. The top will stay open until there is only about 3 inches of space left then will close completely. I used some small rubber bumpers on the top (you will need something to make up for the thickness of the hinge on the back) and the top makes almost no sound when it closes. (I originally used 3 60 inch hinges, but the top would not close completely on its own.) Hope this helps. Very interesting that three of the 60in.lb hinges were too strong. From Rockler's calculator, I think it suggested Around 6 hinges; all 60#. I entered like Half of the weight and doubled their recommendation to get the calculator to work. Perhaps I will place some weights on a dummy piece of plywood first and experiment. 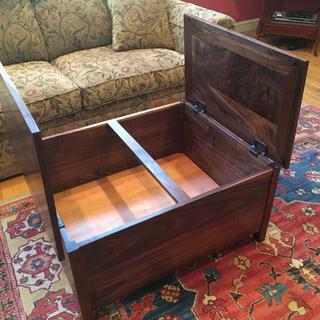 I have built four of these chests with either walnut or cherry lids measuring 20" x 44". In each case I have used two of the 60 inch pound torsion hinges with excellent results. Try using two, keeping in mind you may have to purchase a second pack for that third hinge. My lid was cherry. +/- the same size. don't remember wt., but 2 hinges worked ok. I would not see any reason why a 3rd hinge would not work. 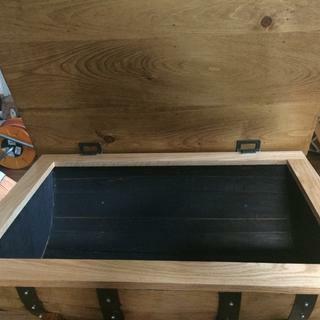 I have made 4 toyboxes using the torsion hinges and the lids will not close all the way. The hinges are overstressed when closing the lid. I used Rockler's jig to install them. Why would this happen? BEST ANSWER: I have made a number of blanket chests with these hinges. Have you checked the mortise depth on the box? If you had cut it even a little too deep, it could cause the effect you are describing. There are other reasons but this is the one that jumped out at me first. Keep after It! I was not aware the hinges needed to be mortised, although the first box I built I did mortise them in with the same results. As a matter in fact both hinges have since broken completely, cracked on the barrel of the hinge from being overstressed, kids using it as a launch pad. So the mortise depth should not exceed the thickness of the hinge on the box side?? I have used the 60 lb. hinges on 7 blanket chests and haven't had that problem. So I'm not sure I can be any help at all. The lids I have used are fairly heavy so maybe that keeps them in the closed position. Sorry I can't be of any help. Are the hinges on the toy boxes the right strength. There are different tensions choices depending on the size and weight of the top. There are instruction for determining what hinge to use on the web page for the hinges. I have found that when I use the 60 inch-pound hinges, the lid does no close all the way. Try using a 30 inch- pound hinges. 40 inch-pound if the lid is on the heavy side. Good luck! I, too, have been unable to get these to work. I have since gone to a simple brass hinge with standard mortise techniques. Hi. Sorry to say, I’ve made 2 so far n haven’t had any issues. I don’t use a jig. The thickness of my chest back is 15/16 inch -- will this require mortise? BEST ANSWER: No you shouldn't. It should just clear at that thickness. I did mortise the top of the back of the chest for proper top spacing. Also, their torsion calculator did not work for me. It said I would need four of the heaviest hinges. Way too much. I used two medium and one heavy in the middle. Bill thank you for the question. However there is no need for mortise on this. If you were to the kid would not close because the hinge when close is of equal height. I hope this is explained well enough. Feel free to ask something else if you wish. I believe so, yes. For the front lip at least. They fit perfectly over a 3/4" edge. I've made four chests using (three ea. of) these hinges, and I've been very please with the results each time. If the back of the chest is thicker than ¾", can I 'carve out' a channel for the body of the hinge to 'sit in' and still use the hinge? BEST ANSWER: Yes you can. I didn't realize that the back needed to be 3/4" thick when I bought the hinges. I had installed a lip on the top of the case - toy box - similar to a horizontal "face frame". I cut and chiseled and basically carved out a location and they work fine. Just not the prettiest on my first one because I wasn't sure how much I needed to remove. The second one went much faster and looked a lot better. Hope this helped. Good Luck. Sure - in fact that's what I had to do for both of the projects I used this hinge on. A little chisel work and it was all good. Personally I chose to inset the tab side of the hinge. Absolutely. I used mine on 1" think stock, I merely build a jig and used my router to thin the material to 3/4" to accept the torsion hinge. Best of luck! Yes - I did exactly that. I also notched the back so that the top was flush with the sides. Worked out well. Best of luck. 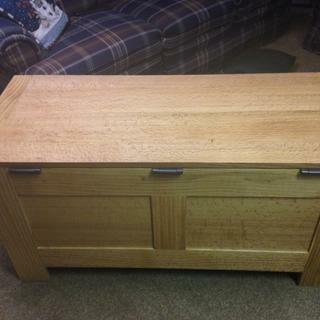 Yes, I did exactly that on a cedar chest that I recently made. The back of the chest was 7/8" thick. Can these hinges be used for a medicine cabinet door application? Each door will be 28.5"x35" on 7/8" wood with an inset mirror. Each door will weigh around 40 lb but the weight would sit differently than a lid so I need to be sure they'll support that weight and operate properly. Hello Chris, I have not used these hinges vertically, (good idea). I feel they should work great for your application. Sure these are a beefy hinges. what size screw do i need for this hinge ? BEST ANSWER: In the set I bought the correct screws were provided in the package. I don't recall what they were. Your calculator says I need 94.5 inch lbs. can I use 2 60's or will that be too tight? BEST ANSWER: that depends on whet you are using them on. if it's a larger lid like a hope chest than your ok with a little overkill. for smaller lids try to stay as close to the recommendations as possible. The calculator is fairly accurate. I used more than required on my project and the lid doesn't shut all the way by itself. After using them, I would say 2 60's would be more than enough. No you will be fine, the hinges are very smooth operating. The illustration shows the support laying on top of the trunk such that there is small gap when the lid is closed. Can I cut a slot and lower the support to enable the lid to contact the trunk? Hi Jan. Did you cut the slot on the back side of the box or did you cut it on the lid? It seems like cutting the slot on the back side would be easier. That is how I installed it and it worked great. Rather using slides, I want to hinge a 12", 3/4" stock, 4.25 lb platform to swing 180 degree back under my farm table. Basically, I will use the torsion hinges upside down. Will it work, and is the calculator at 2, 15 lbs hinges the right hinge for the job? Thank you. BEST ANSWER: It will probably work, depending how you mount it to the underside, but that low of a spring rate won't support much weight on the leaf. It would just fold down. If you put some kind of a sliding support under it, I imagine it would work! I used the 2, 15 lb hinges for a lid 24" x's 40" with 3/4 glued up stock and my grandson is having no problems keeping the lid open. He will be 4 in October. So best guess, your idea will work. Best of luck! I am building a pirate's chest that has a lid of 3+ pounds and a width of 11 inches. Will these hinges work for this application? BEST ANSWER: I do not believe these hinges are appropriate for this application. Using the torsion calculator with a 3 lb. lid of 11 inches width, there will not be enough weight in the lid to allow it to close. What is the range of motion for the hinge? All I have seen depicted is approximately 90 dgrees. Any info would be appreciated. BEST ANSWER: My application worked through 180 degrees. These hinges will open past 90 degrees. The lid to the chest I installed them on was rather heavy, even so just two 60-in/lb hinges held the lid upright until roughly 120 degrees. At that position the lid will slowly tip backwards. Had I installed a third, center hinge or if the lid was smaller weight wise I would assume the hinges would hold the top tipped even farther back. All in all, I have been incredibly happy with them. There is no positive stop on this hinge, it will open as far as your lid will allow it, perhaps far enough to pull the screws out of your lid or back rail of your chest. What is the backswing angle on this hinge? BEST ANSWER: A little past 90, but am not comfortable with taking it past that. the attachment over the back seems to put a great deal of pressure on the wood. I did use them on cedar. It has a swing of about 150 degrees. 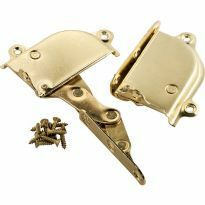 I need to use these torsion hinges for a wooden box with pine lid that is 96.75 in/lb. Their calculator said to use two 30 in/lb hinges + one 40 in/lb hinge for 100 in/lb of support. 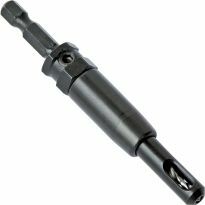 What if I use two 60 in/lb hinges for 120 in/lb of support to save money? I don’t mind if the lid is stiff to close, but will the lid sit closed or will it not have enough weight to stay closed completely and it would forever be ajar? Thanks for your help! BEST ANSWER: In my experience, the issue is not whether the lid will stay closed, but rather will it stay open. To answer the second question first; I am sure it will. The two hinges is a bit of overkill, but the only way I can see to solve the I-only-want-to-use-two-hinges situation. In answer to the first question, there should be no problem as the torsion hinge has no ability to assist the opening process. Which is to say when you close the box, there will be no "spring back" to the lid. The lid will stay all the way closed the way you left it. I hope this is helpful. Let me know if it works. Thank yo so much. Your reply was very helpful indeed and I will heed your advice. I have a lid calculation of 52.5 will a 60 in. pound hinge be to much? BEST ANSWER: No, a pair of the 60 in. pound lid-stay hinges should work just fine. 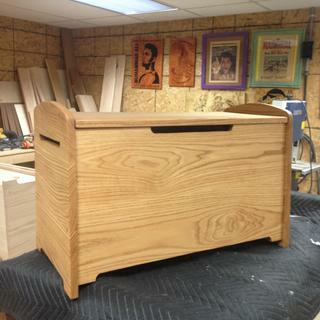 I built a Toy Chest (about a year ago) that had a lid that weighed about 53 lbs and I used the item #36275 hinges. They have worked very well. If you are using 2 hinges, I would think you would want to use a smaller hinge. If only one, it should be fine. do i need some type of limiting device to limit top (toy box)opening to 105 degrees? and wut kind would u recommend? BEST ANSWER: As these hinges have no limiter to prevent the lid from opening too far, you will have to add something to do that. Rather than recommending a specific type, I would easy look at the project and then choose a limiting device that that is appropriate to the design and the purpose of the box. Safety of a child's fingers and such are utmost. Also be sure it fits YOUR taste. 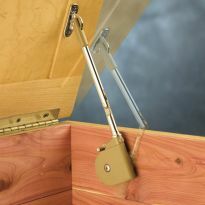 Will Rockler hinge holds it's position on either side of 180 degrees, in other words stay level at the specified weight on either side of the hinge at 90 degrees? Are these rated for exterior use? I would only use these hinges inside as there is no protection against water from getting into the mechanizm. 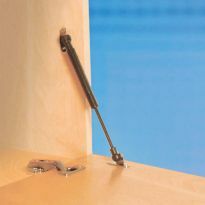 Do they make a torsion hinge rated for exterior use? I want to use them on a patio storage box that will be in a screened in porch. are you protected against rain/snow? if yes the you can use these hinges. Not too worried about snow here in GA. Will be protected from majority of rain, but not moisture in air. Love the idea of torsion hinge, just wish they would make a version geared towards exterior use. Have a 3-yr old and baby. We keep their outside toys in the homemade patio boxes. Right now, lids just sit on top. Want to make it so they can get the toys without us and without smashed fingers. Thanks for the response. Will keep searching for other ways to do this. moisture in the air should not be an issue. glad to help, any time. I wouldn't personally recommend them for exterior use. my hinges arrived today but will not move. What do I do? Do you think these would work with a hidden shelf made from all hickory? The calculator calls for 144 inch-pounds for my lid. I already have (3) 60 inch-pound hinges, which equals 180 inch-pounds. Will those 3 hinges be too much, and cause the lid to either not close, or not stay closed? BEST ANSWER: I'm over-hinged on my latest project and it's not a problem at all. Lid stays exactly where you put it, either open or closed ... and wherever you like in between. 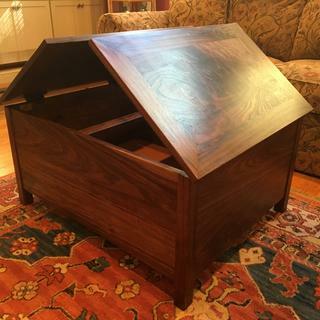 I’m building a chest with a lid that has been dimensioned to overhang 3/4”, on all sides - what is the actual overhand of the hinge and will that work? BEST ANSWER: I have used these hinges with a 1" overhang and they worked just fine. Mount the "saddle" side of the hinge to the back top of the back side of the chest. Be sure the hinges are spaced exactly where you want them to be. close the hinges and place your top on the chest with the desired overhang. Carefully mark the location on the lid where you want the back of the hinge mounted. Remove the lid and dismount the hinges. Place the back of the hinges on the marks and mount them. Mount the lid on the chest. What is the board width to be used with these hinges? 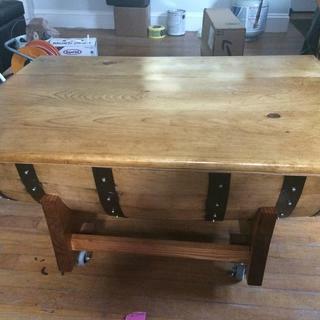 I am making a desk with a hinged top. So the top will open from the base. Problem i have is i have some gaps on the sides. about a half inch. I was thinking to mortise the .5 inch into the base of the project. I am unsure here as the instructions state not need for mortise. Please advise. Thanks for your help. Has anyone had to mortise these hinges? Any advice here would be great. Thank You! BEST ANSWER: I used these for two desks I built. Routing a mortise seemed too complicated and a little risky if I didn't set everything up just right. So my solution was to drill and install wooden plugs at the front edge in each corner to compensate for the thickness of the hinges. I think I got the plugs at the big box hardware store. They're "decorative" plugs used to cover screw holes and sit about 1/4" above the surface. This was just right to match the height of the closed hinge. The only concern would be if for some reason you want/need the lid to close flush to the sides without a gap of any kind. With this method there was a gap between the lid of the desk and the sides, but you would have to look pretty hard to see it. They're desks so the "seam" is never at eye-level. If you do decide to go with a mortise you'll need to do it on back edge and the underside of the lid to make it completely flush. Another tip: I tried the hinges based on the calculations suggested and ended up sending them back. They worked, but were not as stiff as I wanted them to be. They would creep down until it eventually closed. So I ended up buying the hinges for the heaviest top even though my top was made out of lighter limber. If you really want it to stay up when you open it, I'd go overboard beyond the recommendations. Hope that helps! What would happen if I used a hinge rated for a heavier lid than the weight of the lid I plan on using, I may want to upgrade to a heavier lid later ? Would the "stronger" hinge for a lighter lid make it too hard to close ? BEST ANSWER: No it wouldn't cause too much force to close. The only problem that would arise is metal fatigue. It might cause shearing of the hinge over time, causing the hinge to fail. Ok, thanks, that's a relief because I just bought 10 pair. My lid is on a 45 degree angle. Can these hinges be used for this application? Secondly what size of centering tool would be needed for 15in-lb hinges? Using this hinge you will have a gap on the back side that I don't want. How do I. fix it? BEST ANSWER: If you do not want a gap at the back, the only suggestion I can offer is to cut a notch in the vertical riser. The notch would need to be a depth equal to the thickness of the hinge (~0.125 in. ), and a width equal to the width of the hinge (~3.25 in.). I took a different approach for my bench. I used clear self adhesive rubber bumpers ~ 0.125 in. thick mounted on the vertical riser at the front to support the lid with about the same gap width in front as in the back, thereby keeping the lid level. It is hardly noticeable and it has the added virtue of keeping the front of the lid seated flush with the front and sides.